French genre painter; born at Paris July 3, 1831. A pupil of Picot, Montfort, and Corot, he entered the Ecole des Beaux Arts in that city April 5, 1849. Upon his graduation from that institution he at once assiduously devoted himself to the practise of his art. Among the principal works exhibited by Brandon in the Salon have been: "La Canonisation de Sainte Brigitte" (1861); "La Jettatura di Borgo San Spirito" (1861); "La Dernière Messe de Sainte Brigitte" (1863); "La Charité de Sainte Brigitte" (1863), a design in encaustic for the oratory of the Church of St. Bridget at Rome; "Le Dimanche de la Plèbe Romaine au Transtévère" (1865; medal), a water-color; "Le Baiser de la Mère de Moïse" (1866); "Le Sermon du Daian Cardozo à la Synagogue d'Amsterdam, le 22 Juil. 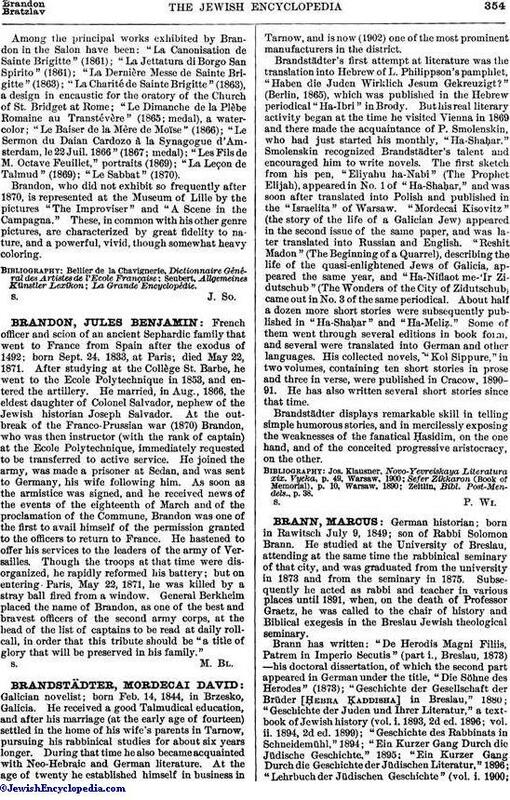 1866" (1867; medal); "Les Fils de M. Octave Feuillet," portraits (1869); "La Leçon de Talmud" (1869); "Le Sabbat" (1870). 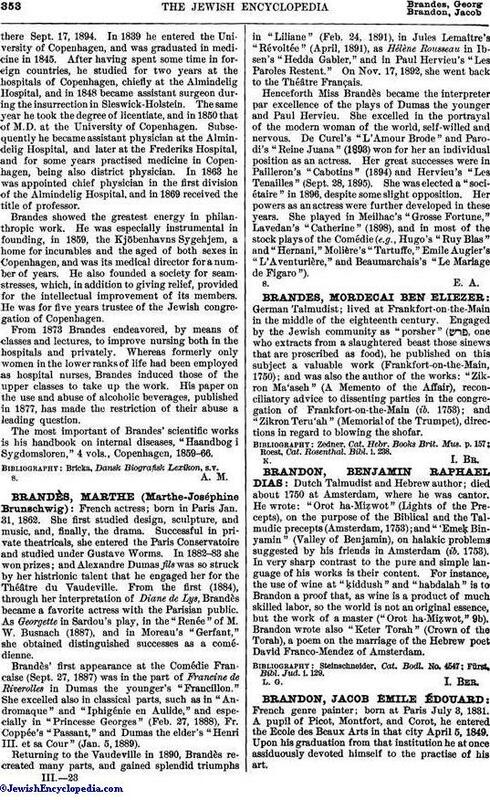 Brandon, who did not exhibit so frequently after 1870, is represented at the Museum of Lille by the pictures "The Improviser" and "A Scene in the Campagna." These, in common with his other genre pictures, are characterized by great fidelity to nature, and a powerful, vivid, though somewhat heavy coloring.